It is 25 years since myself and my wife Christine took over the running of The Wells Traditional Shotokan Karate group. The time has flown by, and although I was a young man, in my early thirties when I began my life as a martial art teacher, I am now a couple of years away from my sixtieth year. A person may be excused for thinking that it is likely that I may feel a bit stale, or even cynical about the people that I have encountered and in many cases taught throughout these years, and maybe even the notion of retirement maybe creeping into my mind. Let’s face it, if our wonderful art form was a sporting activity, I would have been over the hill many years ago, this is the real strength of martial arts, we are never too old, and therefore wisdom born out of not only decades in the Dojo, but also from life experience play a major role in our training. It has been a great privilege to teach many people to the level of first dan and beyond in this 25 year period, and seeing these people develop in positive ways that will not only benefit them but also their dependants and love ones has been nothing short of uplifting. It is for these reasons along with my continuing love for all things martial that any form of slowing down or indeed retiring has never been further from my mind. As most of you are probably aware; we as a group have had two more Dan advancements. Firstly we have the promotion of Dave Chayter to first Dan. This is a particularly pleasing result as for want of a better term Dave is no spring chicken. I sometimes think that new adult students may think that the black belt is, due to their age out of reach. People such as Dave prove that this is not so. For this reason I am sure that all members will join with me in congratulating him on his achievement. The other promotion that I wish to speak of is that of Joe Andrews to 4th Dan. This is an extremely high grade, especially when you consider Joe is only 26 . Joe started training with us when he was nine years old. I am sure he would not mind me saying that he was not really a very gifted student. I saw and see many stages in his development, firstly fitness and strength, secondly grace and coordination, and lastly confidence and thoughtfulness. In many ways Joe is the furthest I have taken my training. In terms of personal development I think Joe has gone further in his short life than most people achieve in a full lifespan. In time his ability will surpass mine. Is this not the wish of all teachers? As I stated earlier, the level of Joe Andrews Karate when he was a kyu grade was nothing special, I think all students that wish to make something of themselves through their training should take heart from this. I see many examples of great potential in the Wells group. Always remember that regular Dojo training and daily personal practice are what develops good Martial arts! Some of you may be aware that as well as Shotokan Karatedo I teach a full syllabus of Yang family Taijiquan (Tai chi chuan). It is my personal belief that at some stages all Martial artists should embrace Taiji, its slow, therapeutic movements are of great benefit for not only the more advanced yielding elements of all martial art systems but also have a rejuvenating effect on the body and mind. So maybe more of you might investigate this system with me in 2015. In conclusion please include your training in an appropriate place in any New Year’s resolutions that you may make, and let’s try to make 2015 a positive year for all our members. As from 1/10/14 Tuesday and Thursday Karate training times have changed. I wish a happy new year to all my students and indeed to anyone that reading this message. I am most definitely getting old, the last year passed unbelievably fast. Those of you that know me will be aware that I am inspired by all martial arts and my studies range from Karate to Taiji Quan, however I remain a Karateka at heart. My love for Karate stems from the idea that we can constantly improve ourselves on every level through daily training. There are still those that believe that Shotokan Karate is merely a method of learning self defence techniques against a human attacker. This is an extremely shallow perspective of karate training, and is indeed a shallow way to look at self defence per say. Our training should always be a healthy activity and protect us from attack whether violence or germ based. This is the Karate that continually inspires me after 32 years of continual training. This is also the Karate that I attempt to teach. If I was to sum up my Martial Art in two words I would have to say it was effective and healthy. So my new year’s message is this: dig deep, train hard and often, challenge yourselves, oh and enjoy it! On Saturday 23rd March Wells Traditional Shotokan Karate Group held its first coloured belt grading of 2013. The grading was overseen by husband and wife team, Paul and Chris Mitchell. 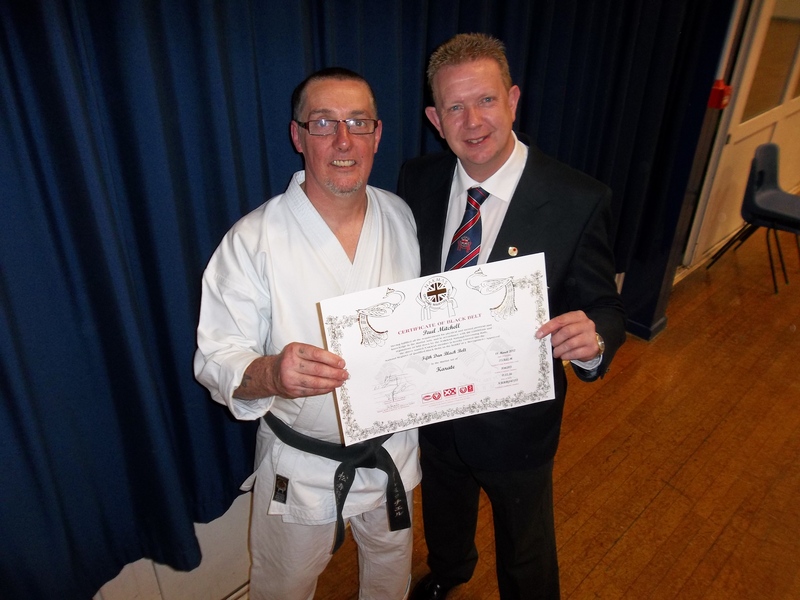 Paul Mitchell (5th dan) has headed the Wells based class since 1990. Despite the usual nervous tension there were thirty successful entrants from seven years old upwards. Shotokan Karate is a fantastic family activity, and the student base at the Blue School reflects this. Although the minimum age for children to start training is seven, there is no upper limit. Martial Arts as well as being an interesting lifestyle choice are also a great way to get and stay in shape, regardless of age or physical ability. Wells Traditional Shotokan Karate was started in the early 1970s, making it one of the oldest Martial Art groups in the Westcountry. Here we are again – Another year gone by. I am definitely getting older and the years are most certainly passing by much faster. As I often state in my classes I am not a Christian, but I do choose the Christian New Year as a threshold for renewal of my commitment to the concept of “training” as a way of life. For me, this idea of a lifestyle centred around my training is pivotal to my existence. The notion that we as individuals come into this physical realm and by our efforts either rise or fall from the level of our birth has always been an uplifting concept for me. In this way all people are truly born equal. There is a saying in Karate that “training is like pushing a cart uphill”. Life as training is certainly like this, if we don’t constantly push (ie. We stop or give up) we slip backwards. As I have gotten older I have realised that there are most definitely times that we must find a plateau on our personal hill to stand and appreciate the view and what we have gained from our efforts. Our Katas teach us this – They are mostly hard and fast but every now and then they slow down, they chill right out, to remind us that life is not to be rushed and that poise must play a large part in our development. I started out to write this New Years message in order to encourage my students (and also anyone else that may read it) to continue and also increase their efforts in their training, as most certainly the more you put into your training the more you get out of it. Some people are like “tourists” and in the beginning this is fine, but at some stage one must dig in deep in order to reap the benefits in terms of body, mind and spirit that a life of training has to offer. As I started to write I realised that all I can really say in terms of encouragement is to explain what training means to me. No two people are living the same life – As a teacher of Martial Arts my responsibility is simply to assist my students to reach their full potential as human beings and to help them develop the strength and tenacity to find their own concept of reality. I should imagine that like me, most people that read this are feeling that we are living through pretty negative times. Modern living has bought us to this point. Please don’t get me wrong, I do not hanker for a time when things such as sexism, racism and homophobia were the norm and as a culture we have most definitely progressed, but as I stated in my last New Year’s message I do feel that our love of materialism has had a seriously detrimental effect on our young, who in turn will become the inheritors of society. Again my message is that through constant training we can have the best of both worlds. In reality there has never been a better time to be alive. Our technological age and achievements have given us a much greater understanding of the nature of reality, but knowledge without ability is Yin without Yang. Only half the story. In my teaching I often refer to energy. In fact, I often state that everything is constructed of energy. This lies at the heart of our training. To change even our smallest element in a positive manner, to me is the entire point. Obviously what I am talking about is a relatively high level of practice that has the possibility of lifting the trainee beyond the merely physical levels of fitness and self defence. Karate and indeed all training is only special if the teacher and the trainees treat it so, otherwise it is just like everything else. So my message for 2013 is that I promise to teach to the very best of my ability and I expect my students to train in the same way. Oh, and of course we will try to enjoy ourselves along the way! 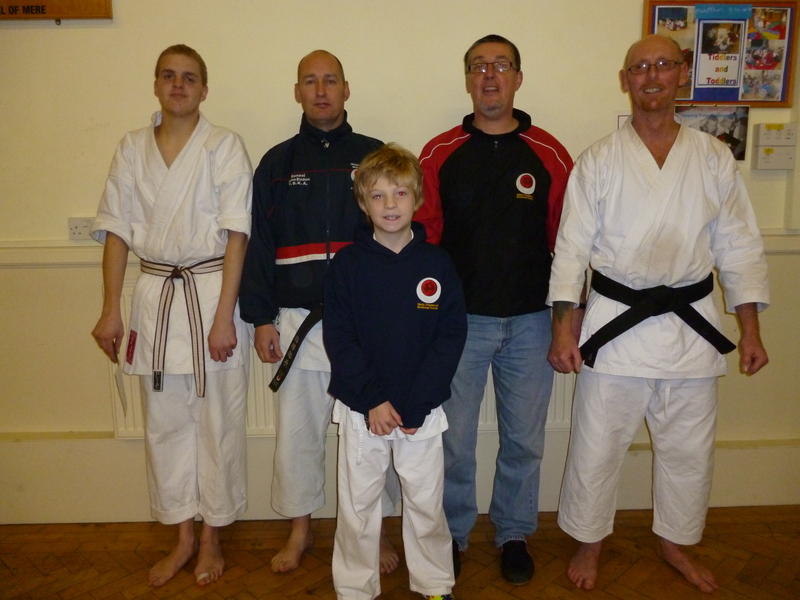 Congratulations to Wells members that sucessfully passed their grading on 15th December 2012. Picture below. Congratulations to Sensei Paul Mitchell on obtaining his 5th Dan. Congratulations to our three members who sucessfully took their Shodan grading on 17th December 2011 under Sensei John Euden 5th Dan. A good grading – Well done all! So here we are at the start of another year – 2012. I would like to say that this new year is full of promise but I think you’ll probably agree that socially and economically our society is in a pretty bad shape. My feelings on this matter are mixed to say the least, firstly it saddens me that the most vulnerable in our world suffer the most but the positive side of this situation is that it can cause many people to re evaluate the things which are important to them. Do we really want to go much further down the road of materialism? The question to me is, does this desensitise and cause our young people to become selfish and lazy and does this in return make for decent caring, responsible adults? You may at this point be wondering what does this all have to do with Karate training. I have to say absolutely everything. To me Karate Do is the antithesis of modern living. This is why I feel that to truly train, one must feel for the past and live in the present whilst looking to the future. It is all too easy whilst training to get caught up in the movement of Karate and to think that it is purely a physical exercise but these movements are just your tools, they must be sharp and they must work. But all said and done karate training is about perfecting your inner nature by using your outer form. To do our best to keep all of our classes running. To continue to charge by the session rather than charging monthly by Direct Debit as is practised by most Martial Art schools. To ensure that the high standard of tuition and personal guidance will continue throughout the year. To offer Nationally recognised Kyu and Dan gradings. To ensure that you have access to extracurricular training sessions both at Local and National venues. Train regularly, please remember that all students are required to train at least twice a week between gradings. Keep your Licence up to date – out of date = no Insurance. Remember superficial training has limited purpose. In Karate, as in life – one should strive for high ideals.